Featuring nearly sixteen hundred post-production and music effects preset-algorithms, never before has Eventide unleashed so much power for your creative endeavors. The H8000FW brings expanded digital connectivity to the H8000 range, offering 8 channels of digital audio I/O via AES/EBU, ADAT, and FireWire, all 24-bit up to 96kHz. In addition, the H8000FW incorporates the expanded analog I/O previously featured in the H8000A, which consists of 4 channels of analog I/O. Featuring 1,800 post-production and music effects preset-algorithms, never before has Eventide unleashed so much power for your creative endeavors. The H8000FW offers four channels of pristine analog I/O combined with eight channels of AES/EBU, ADAT, and S/PDIF I/O. New FireWire I/O now allows direct connection to your Mac or PC so you can directly patch 24-bit audio to and from the eight inputs and outputs. The analog inputs feature either guitar-friendly ¼" hi impedance input jacks or XLRs. The H8000FW also offers remotely switchable true bypass. With the H8000FW you will run out of ideas before you run out of DSP power. With our catalog of over 230 effects modules, you can create effects never before thought of either from the front panel or using the supplied development tools for PC or OS X. Whether creating your own unique signature effect or dialing up one of our studio standard effects from the plethora of preset-algorithms, you will never run out of creative possibilities. The H8000FW is chock full of our best post-production effects, including: CB Radio, Cellular Phone, Long Distance, Random Dialer, Off Hook!, Real Dialer, Megaphone, Shortwave Radio, Traffic Report, Radio, Intercom, Public Address, Fries With That?, Office Intercom, Sound Truck, Talking Dashboard, Clock Radio, Bullhorn, Airplane Background, Jet Flybys, TankAttack, Mortar Shells, Stormwatch, TV in Next Room, Boom Box, to name a bunch. Also included are templates for eight precision delays for multichannel video post applications, and tools specifically designed to facilitate 5.1 frame rate conversion and its associated problem of pitch correction, along with a dedicated channel for time code delay. The H8000FW offers everything you need to control its parameters and functions from a remote. If you are on stage, the H8000FW offers full MIDI control or analog control. ¼" inch TRS jacks accept up to two external foot pedals, up to six external foot switches, or a combination. If you are on the mixing stage, or behind the console, Eventide's EVE/NET™ remote brings all the control and graphics display of the front panel, along with eight continuous controllers, to the sweet spot of your choice. The H8000FW is packed with 5.1 halls, chambers, rooms, booths, ambient spaces, and plates, as well as a full tool kit of multichannel effects. Included are eight individually adjustable sets of straight delays, modulated delays, ribbon delays, reverse delays, panning delays, diatonic shifters, flangers, EQs, phasers, tremolos, and filters. The H8000FW offers twenty MIDI Virtual Rack preset-algorithms, featuring up to five full-blown effect processors ganged together. Each preset offers ten different tweaks which can be programmed, stored, and controlled in real time through MIDI. 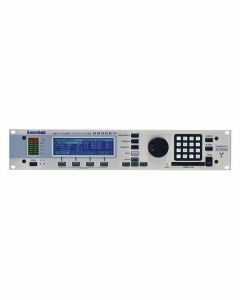 Up to forty-five different parameters can be controlled with one MIDI control message. Individually optimized for guitar, vocals, or percussion and designed with performance in mind. Single effects blocks are also offered as separated presets so that effect chains can be assembled using VSIG. The H8000FW offers 174 seconds of mono or 87 seconds of stereo, leaving you plenty of time for looping and flying in choruses. It can be used in conjunction with the arsenal of effects. The H8000FW offers fast, precise triggering. Eventide's Timesqueeze® algorithm has been proven in the demanding arena of broadcast production. If you need to time compress or expand your 5.1 audio for an HD broadcast, our new phase-locked 8 channel Timesqueeze is fast, simple, and sounds great. The H8000FW incorporates Eventide's most advanced pitch shifter optimized for the human voice. The UltraShifter's real-time adaptive resynthesis allows for unmatched modification of vocal timbre. So, if you are changing gender or going for something completely bizarre, we've got you covered.